Samsung has released a new commercial, teasing its highly anticipated folding smartphone, the Galaxy Fold. 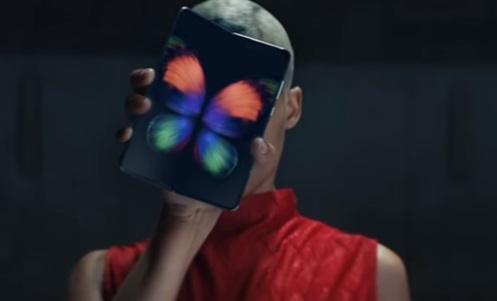 The spot, set to the tune of the 2014 single “Centuries” by Fall Out Boy, features a contortionist doing flexible poses and taking out, at the end, the Galaxy Fold, and revealing the iconic butterfly that’s been animated to flap its wings when the handset is unfolded into a tablet. The butterfly image was the base for eight original wallpapers, all depicting the butterfly in imagery crafted to highlight the smartphone’s unique display, which splits down the middle. The Galaxy Fold has two displays – one on the outside, which is a 4.6-inch HD+ Super AMOLED panel with a 21:9 aspect ratio, and another that’s revealed when you open the phone up, which is a large 7.3-inch QXGA+ Dyanic AMOLED canvas with a form factor of 4.2:3, allowing you to enjoy a tablet-like experience. “Galaxy Fold opens smoothly and naturally, like a book, and closes flat and compact with a satisfying click. To achieve this, Samsung engineered a sophisticated hinge with multiple interlocking gears. This system is housed in a hidden enclosure for a seamless and elegant look,” Samsung said in a press statement about the phone’s opening and closing mechanism. This is not the first time the South Korean tech giant gives people a glimpse at its foldable smartphone, priced at $1,980. It officially announced it back in February, right before MWC got underway and it officially opened up reservations on April 12, 2019, which means potential customers are reserving a spot in line to be among the first people to buy it when pre-orders open on April 25. T-Mobile and AT&T are, for now, the carriers you now choose from to reserve the device. The Galaxy Fold will be available in Space Silver with 512GB of storage and comes with a free carbon fiber case as well as a set of wireless Galaxy Buds.